Driving through south-western Alberta on our way to Banff, it was the last thing we expected to see. After kilometre upon kilometre of flat, overcast skies and grey asphalt, the words almost seemed to jump off the brown government-issue highway sign: “Next Exit - Grizzly Paw Brewery”. Bleary-eyed, parched and half-starved from a day of travel, I had to restrain myself from grabbing the wheel and settled instead on a croaked, "take the exit! Oh god please take it!" Grizzly Paw Brewing is located in a fairly nondescript building in downtown Canmore (so nondescript, in fact, that we drove by it at least three times). Luckily, their beer is anything but. 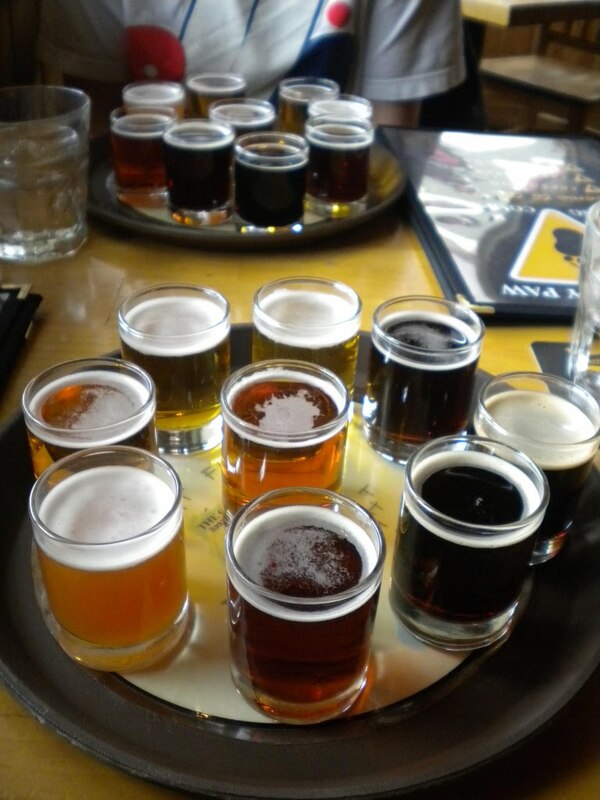 Being our first time at the Grizzly, we both ordered the taster trays - which included a generous 9 different beers. As a coffee addict... I mean appreciator, my jaw literally dropped when I tasted this stout. Out of all the coffee stouts I've tried (and there have been a few), this is by far the most coffee-infused. It tasted as if it was almost equal part coffee and beer - which in my mind, means the world's two best beverages, united at last in one delicious pint glass. The waitress told us the unique flavour was because we were actually drinking a special batch of the Moose Knuckle - the brewmaster had added local, specially-brewed coffee beans to the brewing process. Ingenious! If you don't love the bitter taste of espresso, you probably wouldn't like this. But if you love the bite of espresso like I do, you'd LOVE it. Unfortunately, because it was a special, limited-time batch, it wasn't available to buy - even on-site. Despite it being June, I had a flashback to December when I tasted the Belgian Brown. One of the Paw's winter seasonals, it had an overwhelming aroma and flavour of fresh nutmeg. This spicy, dark ale reminded me of the Granville Island Winter Ale, but with more nutmeg, less vanilla and more of an overall "spicy" flavour. I'd pick it over the GIB, but like the GIB, probably wouldn't want more than one or two in an evening. Would be perfect for a winter evening. Upon first glance, this lager didn't inspire much hope - almost clear, it looked like it had the potential for extreme blandness. Was I ever wrong. The Gold Medal stands out in a sea of lagers that can only be described as "light". While it was light in colour and weight, it was full of flavour. Gold Medal is aptly named, because the best way I can describe its taste is "golden". One of the most unique and surprising beers I've tried in a while. Grumpy Bear Honey Wheat - Not my favourite honey, but tasty. Beaver Tail Raspberry Ale - Surprisingly light, this unfiltered wheat ale had just a touch of raspberry. A nice, balanced wheat flavour. Great summer ale. Big Head Nut Brown - fairly run-of-the-mill, but a solid nut brown ale. I'd definitely order again. Rutting Elk Red - Caramelly, roasty goodness. Delicious. Indra Island IPA - balanced IPA, with a quick hop bite. Good! Needless to say, the Grizzly Paw has found a fan in me. Didn't hurt that the food was decent too. If you're ever in the Banff area, it's definitely worth making the 20-minute drive to Canmore to check out the Paw. Tell 'em I sent ya.